It seems like it might be time for us to have some actual genuine knitting over here. 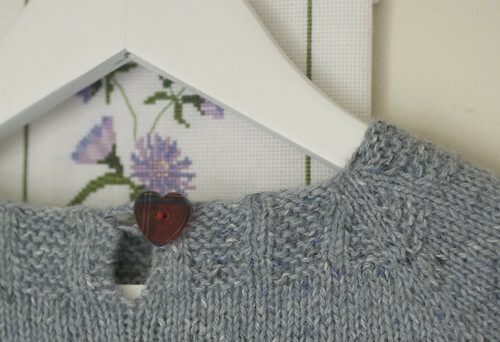 Between this blog and the last, I don’t think I’ve had anything to show for myself since the parade of Christmas knits in early January. And I’m claiming that’s my main hobby. Oops. Actually, if you count it by time spent recently my main hobby appears to be doing extra work for the office job. It’s been urgent, and important that I did it (and I do get paid for the extra days) but “I’m a full time Mama on Thursdays” hasn’t exactly been true recently and I fear that Kitty has watched a smidge more CBeebies than I would ordinarily let pass. Still, all this is (hopefully) behind us now and I have high hopes of making it to knitting group next Thursday and other ‘out of the house and away from the computer’ types of places. The truth is, I’ve not been knitting very much. Well not very much for me anyway. I’ve got a little Kitty-knit underway but not much else. 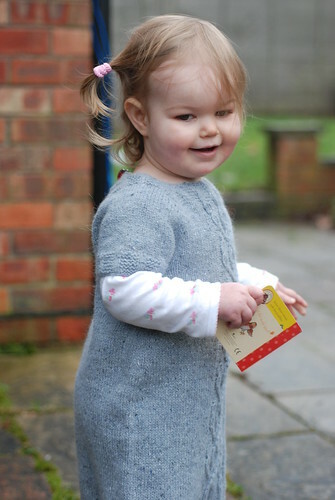 What I have been doing is tying myself in knots with the computer trying to write up the pattern to a toddler-sized dress that I started designing last October and finally finished (many, many, many, many re-knits later) at the end of January. 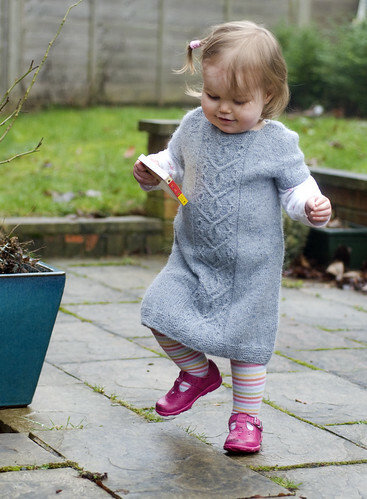 The Dreaming Spires Dress, published through Ravelry (but available even if you don’t have a Ravelry account) right here. 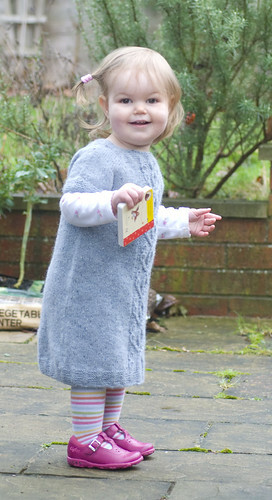 It’s a top down, seamless little tunic dress, knit in the round with raglan sleeves and a cable down the front. The hem, cuffs and neckband are in garter rib, with a little placket and a pretty button at the back to make it easier to get off and on. The inspiration came from a trip to the dentist in Oxford. Not the most salubrious of beginnings I grant you, but it is a beautiful city, full of familiar towers, steeples, turrets and twizzly bits, and a dental check up gives you plenty of time to lie back and imagine a little girl’s dress with a spire twisting and turning up the middle. The yarn is Rowan Felted Tweed, described as DK now they’ve added an aran weight but it’s more of a light dk/sport weight in real life. It isn’t the most obvious choice for a toddler dress, but this isn’t a dress to go next to the skin anyway, and it is superwash and super warm. Kitty has worn her dress over a long-sleeved vest on some of the coldest snowy days we’ve had this winter and she’s always stayed toasty warm. Debbie Bliss baby cashmerino (my favourite baby yarn of all time) would probably work as a substitution and give nice cable definition, although you’d miss out on the tweedyness that makes the stocking stitch just a tad more interesting. They say that having a child is allowing your heart to go walking around outside your body and they’re more than right. This, if you’ll allow the parallel, is allowing my creativity to go walking around outside of me. I hope it meets with friendly souls, I hope they like knitting the pattern, and most of all, after my relentless checking, cross checking and double checking, I really hope that the maths adds up. Size: 18 month -2 years. Time to make: 3 months. It probably doesn’t take that long if you’re not designing it on the fly and reknitting more times than you can count because of a chronic inability to count. Always feels great when you can finally say something’s finished! Congratulations on your first pattern for Kitty sized dresses. It not only looks beautiful, but in that yarn, hard wearing too. The best of both worlds for an active girl about the playground like Kitty. I love it. 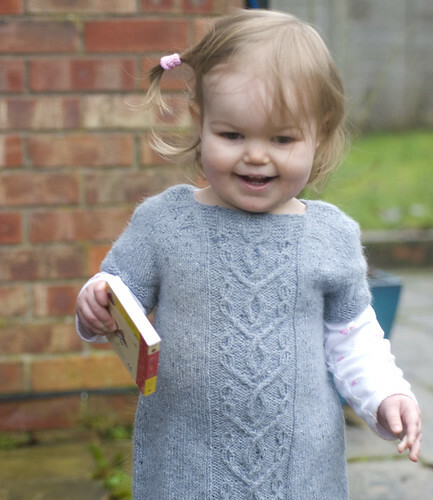 And I really wish I had a little girl somewhere in my friends/family to knit for. This pattern is perfect Carie…tells me maybe you should devote more time to designing (why yes, I am ignoring that your life is already quite full…I’m allowed!). Then the instructions read to repeat the second row, changing to circular needles, which is the right side, increasing row, once more after joining the work in the round. That would actually result in another 8 added stitches (a 6th repeat) 132 stitches + 8 = 140 stitches. However, at this point, your instructions read that I should have a total of 128 stitches instead of 140 stitches. BTW, I love the pattern (and the pictures of Kitty!). I am making this for a granddaughter due in October. Now all I have to do is fine some awesome striped tights and some pink shoes to complete the outfit! I can’t see your blogger profile so I haven’t got and email address to respond to – I’m just hoping you’re keeping an eye on this post. Firstly, many, many apologies, there is a typo. The good news is that the instructions are correct, it is just the stitch count at that point for the first two sizes that is wrong. It should (as you have discovered) read 140sts. The next stitch count is correct, as are the ones for the larger sizes. I really hope you haven’t had to do huge amounts of mental maths to try to figure it out and I can only apologise. I’m going to update the PDF as soon as I’m reunited with the right computer tonight and send out the update to everyone who has the pattern. Many thanks for getting in touch and letting me know. PS – pink sparkly shoes are definitely the way forward!